After the leader of the legislative assembly, Juan Guaidó, declared on 23 January that he would serve as interim president, the world’s politicians and media have been offering widely varying viewpoints. Some support Venezuelan president Nicolás Maduro, others have backed Guaidó and the opposition, whereas some have even chosen to come out in favour of neither side and promote a ‘third way’ or compromise path. But before the stunning move from a now re-invigorated anti-Maduro movement in Venezuela, there was already evidence of how the media cover the same events differently if we look at Nicolás Maduro’s contested inauguration for a second term earlier on this month. Juan Guaidó’s announcement has been called a coup, a crisis, outside intervention, a challenge to the Maduro regime, a threat to democracy and all manner of descriptions under the hot Caracas sun. The media have been tying themselves in knots to analyse the continuing instability in the country with the largest proven oil reserves in the world. Indeed, inside Venezuela, there is strong anti-Maduro sentiment online. This article from Caracas Chronicles makes it clear on which side of the fence it stands, saying Nicolás Maduro leads a “criminal dictatorship”: As Venezuelan Bishops Recognize Guaidó, Chavista Mobs Terrorize Local Churches. Looking to the international media, the socialist newspaper Morning Star excoriates the US as an “imperial state” with a bloody history in the region in this article: Stand in solidarity with Venezuela’s people, describing the current situation in Venezuela as “class struggle with the gloves off”. It is indeed true that the United States does not have a good record in Latin America. Despite that, no sooner had Juan Guaidó made his announcement – in what was surely a co-ordinated decision – than the United States led a swathe of Latin American nations and other western allies in recognising Guaidó and calling for fresh elections. Denouncing the opposition as treacherous and proudly supporting the government were its usual backers, notably Russia, Turkey and China. Russia’s foreign minister, Sergey Lavrov, criticised the US for ‘violating international law with Venezuela’ in its support for Juan Guaidó and its pursuit of sanctions against the state oil company, PDVSA. But there has been a slight chink in the armour in more recent days. On 30 January, the Russian presidential spokesman Dmitry Peskov said “without a doubt, President Maduro’s openness to dialogue is highly commendable”, as Maduro suggested he could consider possible talks with the opposition. But did the president truly mean face-to-face negotiated talks? Again, there is further room for interpretative differences here based on the translation from Spanish to English, as the Wall Street Journal’s Anatoly Kurmanaev explains. There were other interesting points to note in reactions in the region. Ecuadorian president Lenin Moreno voiced his support for Juan Guaidó. What is interesting in this case is that under Moreno’s predecessor Rafael Correa the response from Ecuador would almost certainly have been the opposite. Correa was a paid-up member of the socialist bloc across the region at the time, including former leaders Lula da Silva (Brazil), Cristina Fernandez (Argentina) and Michelle Bachelet (Chile) and one that still comprises Maduro along with Evo Morales (Bolivia), Daniel Ortega (Nicaragua) and Cuba (Raul Castro then, Miguel Diaz-Canel now). Evo Morales, the leftist Bolivian president running for re-election later this year, came out with strong support of Nicolás Maduro, whose inauguration ceremony in Caracas he attended on 10 January. Like Ecuador, Mexico has performed a U-turn – only from the other direction. From 2012-2018, when Enrique Peña Nieto was in charge, Mexico City fell into line with its fellow Lima Group members in condemning the Maduro administration. Now that long-time leftist Andrés Manuel López Obrador is president, we have seen a change – no explicit criticism of the government, with Mexico calling for a third way negotiation between both sides. Nicolás Maduro attended López Obrador’s inauguration in Mexico in December, although many Mexican members of congress made their feelings clear with chants of “dictator, dictator” when his name was mentioned. And while all this arguing in the media and discord between regional neighbours and wider world powers continues, the average woman and man in Venezuela still struggle on, as the country battles hyperinflation, with violent and growing protests, crippled by a lack of medicines and basic goods. López Obrador launched his ‘Plan Nacional de Paz y Seguridad 2018-2024’ (National Plan for Peace and Security: 2018-2024) soon after assuming office on 1 December 2018 and after a consultation period that he used to discuss his ideas with politicians, civil society, local officials, members of the clergy and the general public. During last year’s electoral campaign, López Obrador put forward several potential security policy shifts to address the ongoing violence linked to criminal activity. Among these, he suggested amnesties for small-time criminals, alongside a push to wind down the military’s role in combating criminality and the possible legalisation of the cultivation of marijuana and opium poppies. However, in presenting his plan last month, López Obrador placed a notable emphasis on promoting social and economic development instead of his previously announced measures. He said that the government needs to focus on the origins and causes of the structures that drive youngsters towards criminal gang membership and violence, noting that “[most criminality occurs]…where the social fabric is broken, where it affects values, where there is the greatest disintegration of the family structure”. He made sure that special attention was paid in the plan to family life, which he called “the best social security institution in the country”. The new president said that as much as 80% of his plan was related to the prevention of crime through the strengthening of social and familial relationships and an improvement in the economic opportunities for young Mexicans to deal with the problem at source. The economy could certainly act as one of López Obrador’s security policies if his government succeeds in improving life prospects for the young. The minimum wage has already been increased to M$103 (US$5.10) per day from M$88 (U$4.38), a measure that comes into force on 1 January 2019. During the event for the launch of the plan, the president also highlighted his team’s differences with previous administrations, criticising what he saw as a misguided and failed focus on “prisons, iron fist polices, ever more severe laws”. The public is certainly war-weary and thus when it comes to overall results, the security measures that have the chance of the longest-lasting consequences are unlikely to be those that involve greater military or police powers. While major measures may still be backed by the government and imposed during the years in office he has to come, López Obrador may find that if he can steer the Mexican economy towards balanced growth, if he oversees an improvement in the rule of law with investigative and judicial institutions that function properly and if he can make a dent in corruption among lawmakers and the security forces, that the changes the country longs for may start to be realised. The new president campaigned on such a message of change but how much will his security policies be significantly different from those of his predecessor? López Obrador has already watered down several suggestions he has made in the past, notably rowing back from his pledge to take the army off the streets. Another of his proposals is to create a new ‘national guard’ which will be manned, run and trained by serving military forces. López Obrador must ensure that his new body does not suffer the problems that previous president, Enrique Peña Nieto (2012-2018), endured when he tried to set up his own Gendarmería Nacional (national gendarmerie) federal security force. Despite its launch as a flagship security measure by the Peña Nieto administration, its two main aims of a reduction in rural crime and an increase in the number of successful criminal prosecutions were left unfulfilled. López Obrador says that at present only the federal police can be counted upon to combat criminality and violence around the country. He said a restructuring of the police forces was needed, with widespread “decomposition” in the municipal and state police, institutions which have suffered from infiltration by drug trafficking organisations (DTOs). For this reason, the new president said a national guard was necessary, and that it would be formed of the federal police, along with the military and naval police. However, in the preliminary 2019 budget set out by the new government earlier this month, there was no provision made for such a body. One of the major challenges that López Obrador faces is the shifting geography of the violence. He will not be able to apply ‘catch-all’ measures nationwide because of the fractured nature of the violence and the regional peculiarities of the DTOs’ strongholds. When former president Felipe Calderón (2006-2012) unleashed the military against organised crime in a public show of force as part of the so-called ‘war on drugs’, there were several major DTOs focusing mostly on drug trafficking for their main source of income. In the last six years, the captures or killings of many of the main crime bosses have resulted in an explosion in the number of smaller gangs. These local criminal organisations have diversified their activities away from a total focus on transnational drug smuggling to regional extortion, the theft of oil and other easier revenue streams. Rather than previous administrations’ aims of simply trying to cripple the major DTOs, the new government will have to deal with this growing trend of regional-focused crime groups who specialise in particular parts of the country – such as in the states of Guerrero and Michoacán. López Obrador’s proposals will take time to come into force and so the public should not expect a quick fix from his government in the same way that the president himself should not attempt immediate solutions to deep-set problems. Trying to bring to an end the twelve years of the war on drugs will require resolve, after more than 200,000 killings and with more than 30,000 people ‘disappeared’ since the armed forces were first sent onto the streets. There are many complicating factors: institutional weaknesses in criminal investigation and prosecution; the entrenched corruption between state institutions and criminal groups; and the fact that a tailored approach to each region will be required. Of all the public security horrors that Mexico has suffered in recent years, none has gripped the national and international media like the abduction and likely murder of 43 students from the Ayotzinapa rural teachers’ college in Guerrero state in 2014. The Peña Nieto administration ordered an inquiry at the time, but the claim that gang members confessed to burning all 43 bodies in a dumpster on the instructions of the municipal police has been disputed by international experts, who highlighted what they said were irregularities such as confessions obtained by torture and a lack of physical evidence. It is an incident like this one that López Obrador hopes will resolved by the truth commissions that he would like to set up and during his inauguration speech he did indeed announce the creation of a commission to “punish abuses of power” related to the Ayotzinapa students’ disappearance. For him, the past broad-brush excuse of ‘fighting drug trafficking’ has been used to at best play down and at worst promote human rights violations and illegal acts by the authorities. Indeed, since 2006, the Mexican National Human Rights Commission (CNDH) has found that in more than 100 cases of alleged abuse military personnel committed serious human rights violations. The new president has been strident in his denouncement of state corruption and his rallying call against what he described as the “mafia de poder” (the mafia in power) rang out among crowds during his election campaign. But he must also tread a fine line when it comes to, on one hand, fighting state abuse of power and physical, sexual and psychological abuse in state institutions and, on the other, relying on the military to train and run his proposed ‘National Guard’. Furthermore, for now, soldiers deployed on the streets are not going to be sent back to the barracks as he promised in the campaign. López Obrador says that “corruption has converted into the principal function of political power” and he intends to try to weed out dishonest police officers by beginning at the top and rooting out shady politicians first. He is asking for a change of mentality and has been at pains to highlight that this begins with him as the president. In his inauguration speech he repeated his pledge that he and his family would not live in an elevated position above and outside the law. At the same time, he also appears to be trying to realign the conversation about violence and this is evident in how he wants to reset the tone of government away from a ‘top-down’ administration towards a more ‘bottom-up’ vision of governance. He decries previous presidents for what he sees as a martial approach to leadership and promotes in his ‘Plan Nacional’ (National Plan) an “ethical regeneration of society”. López Obrador argues that you can tackle broader, nationwide security problems by looking at the roots of the issue at a local level which he says partly stems from “social resentment due to poverty, marginalisation and the denial of basic rights”. The new president should be lauded for at least attempting to change the narrative – notably with the strength of emotion in particular parts of the National Plan, saying that “the bellicose police strategy of the last 12 years has caused a human and social tragedy of incalculable dimensions”. Although he has been criticised for a nebulous approach to some national issues, his policy ideas for dealing with security and violence span a range of ideas: the formation of a national guard; putting an end to impunity; supporting greater victims’ rights; and potential drug legalisation. Fresh thinking has been desperately needed after twelve years of the war on drugs. For now, López Obrador is laying out a generalised vision of his security policy that looks to tackle the origins of delinquency and crime. It is all very well that he pursues a different approach in words; it is a different approach through actions that will have to be judged as his term gets under way properly in the months to come, for while some investors and business leaders have been unnerved by the new president’s disruptive style, his unorthodox way of governing may open up a greater possibility of change when it comes to security in the country. There has been extensive media coverage surrounding some of López Obrador’s more cosmetic changes to public life such as opening up the former presidential residence and office, Los Pinos, to the general public, and the sale of the presidential plane recently purchased by Peña Nieto. Yet as López Obrador’s six-year term begins in earnest, the age-old problems remain for the new administration of rising, diversified violence and public insecurity in a country where 2018 set a new record for homicides, with 15,973 murders in the first six months of the year. The country’s president John Magufuli came to power in 2015 with a bold list of promises and he has enacted wide-scale reforms to government spending, gone on an anti-corruption drive and brought in free secondary education for all children. He has also spent a good deal of time and money on infrastructure which is an area of government where he has experience. While in the top job he has focused on highway construction, oil pipeline projects and a new railway between the country’s huge Indian Ocean port at Dar es Salaam and the city of Morogoro, 200km inland. However, the ferry sector has not been paid the same attention as the roads and the rails. The disaster on Lake Victoria on 20 September is a terrible reminder of the safety problems with water transport in the country. 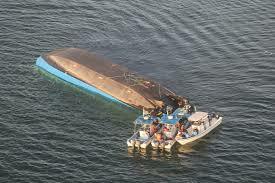 At the time of writing, at least 205 people had been confirmed dead after the MV Nyerere capsized. 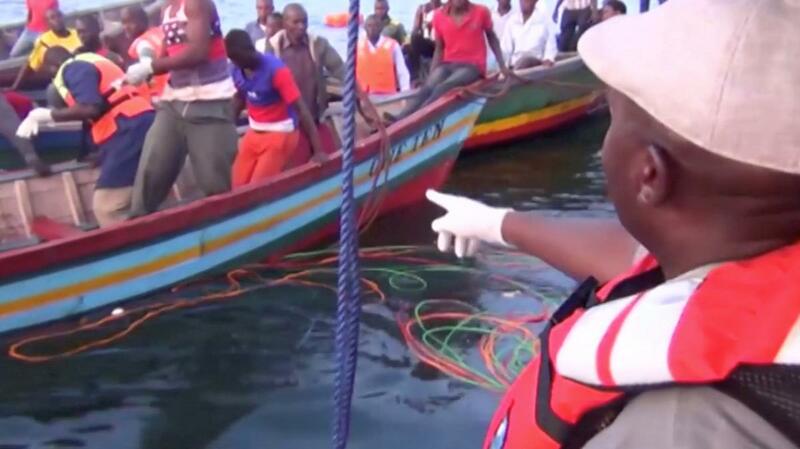 The overcrowded vessel, which was travelling between two of Tanzania’s islands on Lake Victoria, Bugorora and Ukara, was reported to have turned over when passengers raced to one side of the boat to get ready to disembark as it approached the dock. President Magufuli has announced four days of mourning and said his government will cover the costs of the victims’ funerals. He has also ordered the arrests of the management of Tanzania’s Electrical, Mechanical and Services Agency (TEMSA), which is responsible for ferry services. TEMSA admitted it did not know how many passengers were aboard. However, the opposition are pointing the finger of blame for the disaster at Magufuli’s government, accusing it of “negligence”. Two years ago the World Bank criticised the seaworthiness of the vessels plying the waters of Lake Victoria as a “poorly regulated private sector fleet”. The problems are many: failures in the regulation of ferries – many of which are not maintained appropriately – and overcrowding while on board; then malfunctioning alarm systems, a lack of life-jackets and insufficient evacuation procedures when things do go wrong. And even when a vessel is serviced regularly, (such as being fitted with new engines as the MV Nyerere was recently), if the ferry is subsequently burdened with dangerous overcrowding it makes the sleek new motors redundant. Tanzania’s worst disaster was in May 1996, when an estimated 800 passengers drowned when a ferry capsized on its way from Buboka on the western coast of the lake to Mwanza in the south. 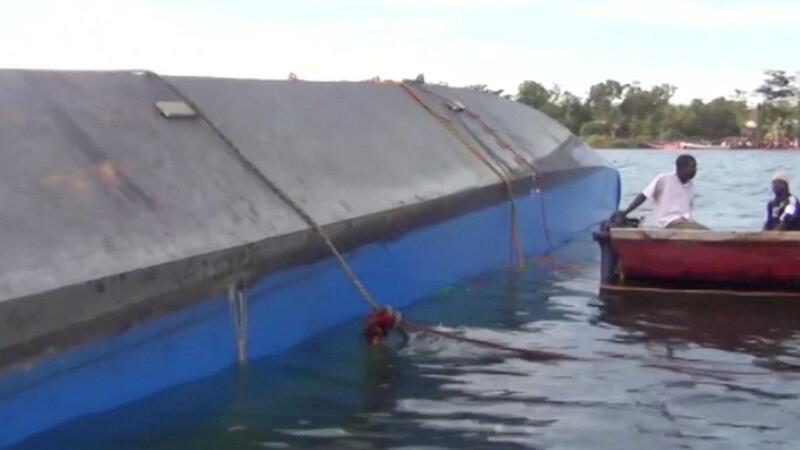 And it not just passengers on the inland ferries that have been at risk of sinking. From 2009-2014 there were at least nine accidents on ocean-going boats operating out of Dar es Salaam port, with five of the incidents resulting in fatalities, according to the Worldwide Ferry Safety Association. The sinking of MV Skagi in 2012 and MV Spice Islander a year earlier saw more than 200 people lose their lives on vessels that were overcrowded. Earlier in the summer, after a cabinet reshuffle, president Magufuli instructed the new minister of works, transport and communications Isack Kamwele to press on with new roads, railways and airports. It would be a gross oversight if a new focus was not also paid to the problematic (and, at times, fatally dangerous) ferry sector which is in urgent need of improvements – as demonstrated by the most recent tragedy on Lake Victoria. As the car horns blared, loudspeakers boomed and thousands of people poured into the Zócalo main square in Mexico City on Sunday evening, Andrés Manuel López Obrador must have been pinching himself. He was president-elect, at the third time of asking, and there was unbridled joy in the plaza in front of him. The mood in the camps of the defeated, establishment parties would have been funereal. There are high hopes for López Obrador, or AMLO, and there is no way of knowing yet if he will go down in history as a brilliant leader or another scorned and discarded president. What is certain is that he was carried to victory on the back of both direct support for him and millions of protest votes against the conservative National Action Party (PAN) and the governing Institutional Revolutionary Party (PRI). 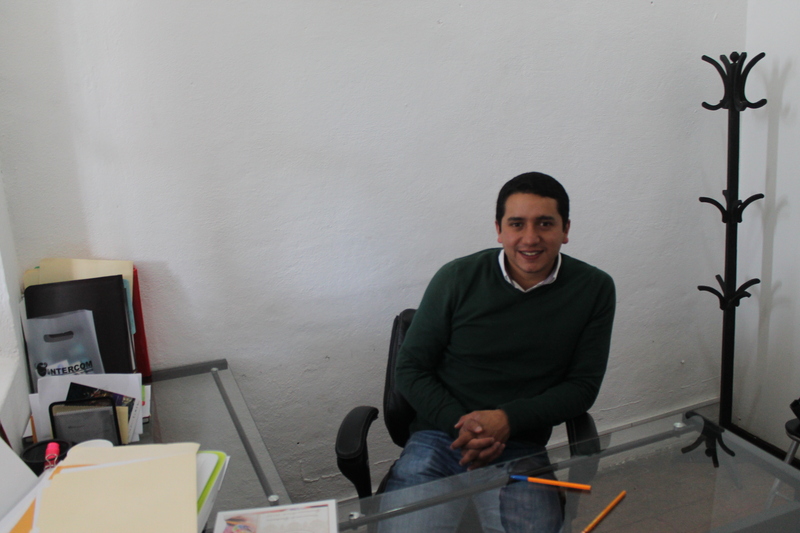 25-year-old federal deputy Rodolfo Nogués Barrajas, a PRI member of congress from the small town of Jilotepec, about 90 kilometres north-west of Mexico City, thinks though that there is a way back for his party. He admits that this is a “step backwards and a moment of reflection” for the PRI, which governed Mexico in an unbroken period of 71 years until 2000. It was remarkable that we were even talking about the PRI still being alive here. It should be in perfect health. 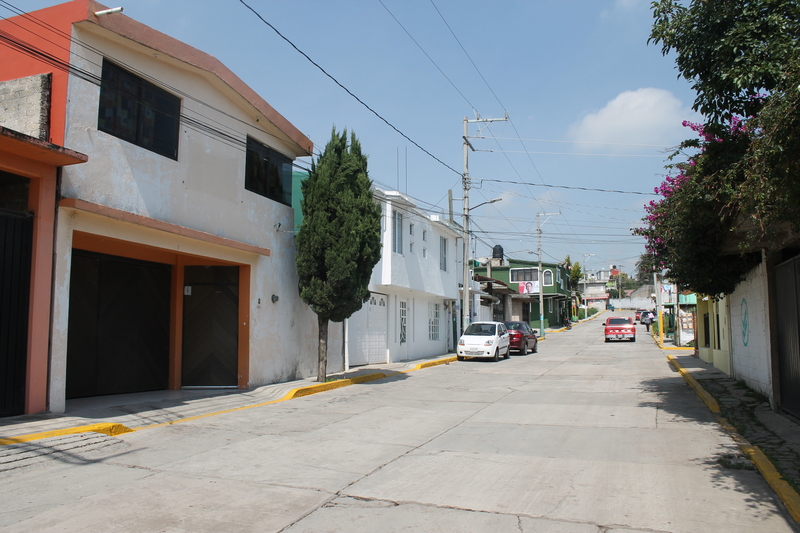 Jilotepec is in Mexico State, the country’s most-populous entity, and this is the PRI heartland. 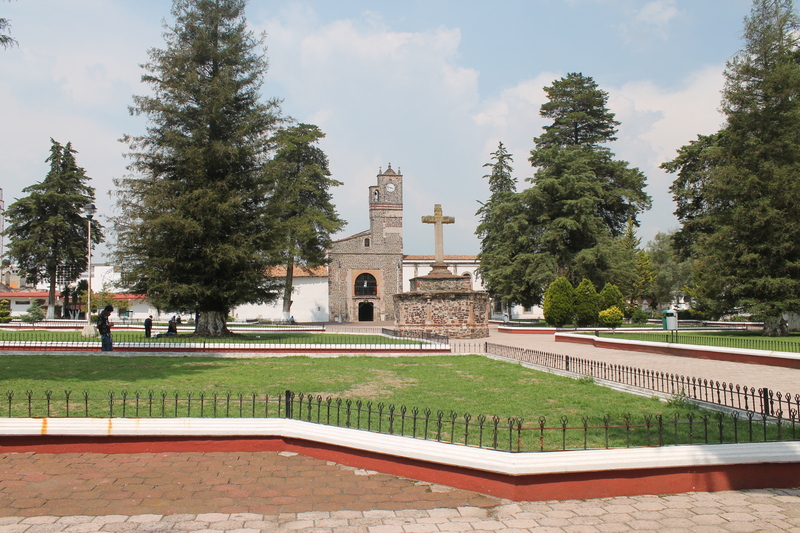 The current president, Enrique Peña Nieto (PRI), was born in Atlacomulco, just up the road from Jilotepec. 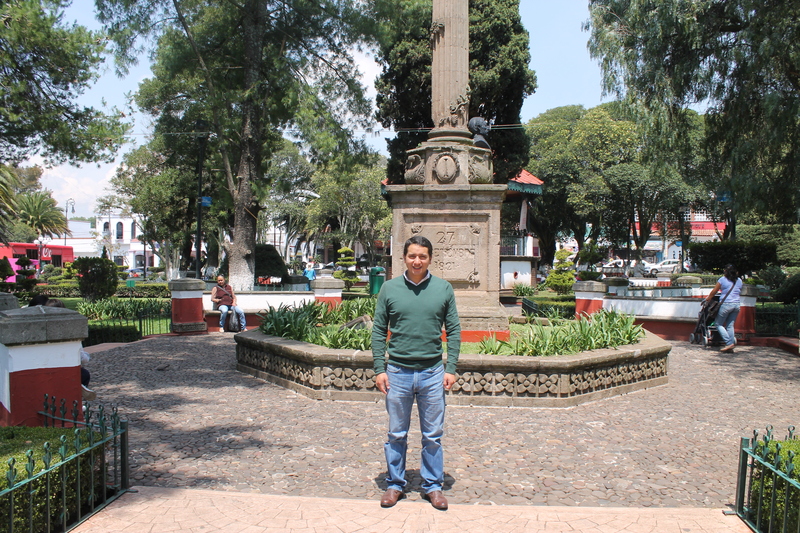 The current state governor, Alfredo del Mazo Maza (PRI), was born in the state capital, Toluca, and is the son and grandson of former PRI Mexico State governors. President Peña Nieto is del Mazo’s cousin. Given all this, Morena’s near-clean sweep of the lower house representatives in Mexico State (winning 42 out of 45 seats) is a stunning upset. I asked Nogués Barrajas what went wrong for the PRI’s candidate for president, José Antonio Meade, who came third in the race for the top job. The MP lays the blame squarely at the incumbent’s door. Enrique Peña Nieto, the outgoing president, has had some of the lowest approval ratings for any Mexican leader in history, he has been caught up in corruption scandals, and – though he promised to get a handle on the violence – has presided over more than 109,000 murders during his six-year presidency. Meade, a 49-year-old technocrat who served under PAN president Felipe Calderón as well as Peña Nieto, was an effective administrator but had limited experience when it came to winning elections, the MP told me. But isn’t a change exactly what the people wanted? The PRI has had 77 years in power since 1929; surely that was long enough to show the people the party could govern in a trustworthy manner, I put to him. Do you not think that despite worries over any possible disillusionment with AMLO the voters are simply tired of establishment parties and endless corruption scandals, the seemingly uncontrollable violence and the scarring inequalities, I asked him. As he drains the rest of his coffee, he appears more conciliatory. It was a spectacular night for the veteran left-winger, finally landing the top job after two previous presidential defeats. For the first time in 89 years, a party other than the centrist PRI or conservative PAN has control of the country, and it is a 64-year-old progressive at the helm. López Obrador took a decisive 53% of the presidential vote, driving home his campaign polls advantage and leaving his two main rivals biting the dust. 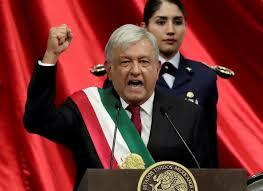 His party, Morena – which has only existed formally since 2014 – also played its part by winning five state governor races, the coup of the Mexico City mayoralty and heading for a major influx of MPs and senators in parliament. 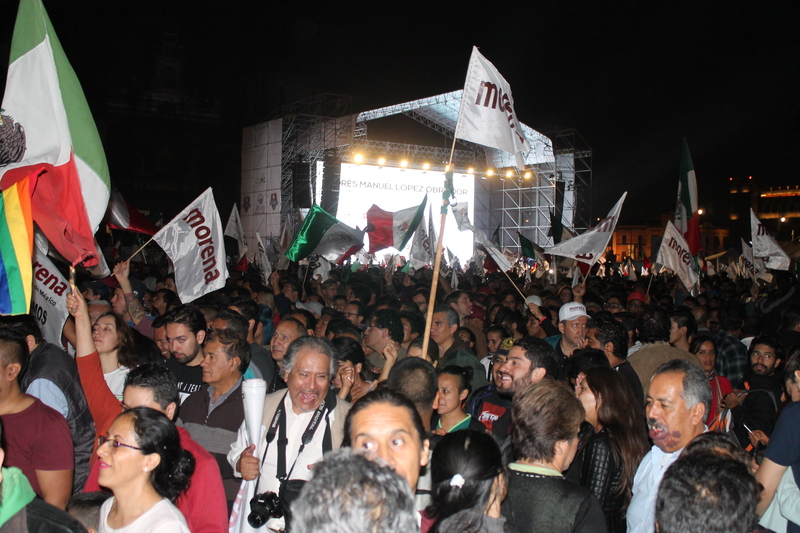 As the realisation dawned on the Mexico City population on Sunday evening just what was happening – that the bubble of the established parties had truly been burst – thousands of AMLO supporters flooded the city’s central Zócalo square. 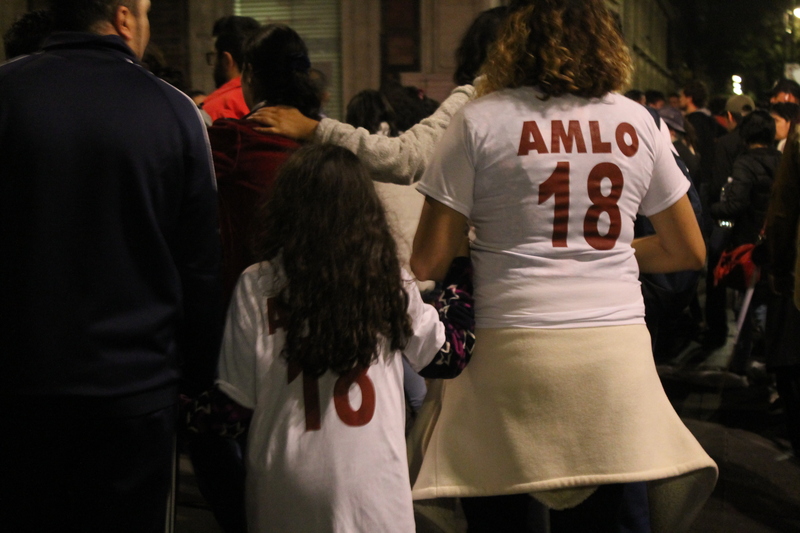 One of the main drivers behind AMLO’s overwhelming results has been the large numbers of protest votes, or votos de castigo, cast by millions of Mexicans fed up with corruption, violence and the gap between rich and poor and his supporters honked horns, flew flags and cheered in a combination of disbelief and hope as Latin America’s second-biggest economy toppled entrenched interests and establishment parties with a powerful, progressive left hook.